If you live in the east valley and enjoy boating or water skiing, you are familiar with Saguaro or Canyon Lake. If you live in Peoria or Surprise, Lake Pleasant is exceptionally close. But for those that live in the northeast part of the valley, Bartlett Lake is the safe haven for water sport activists that live in Scottsdale, Carefree and Cave Creek. 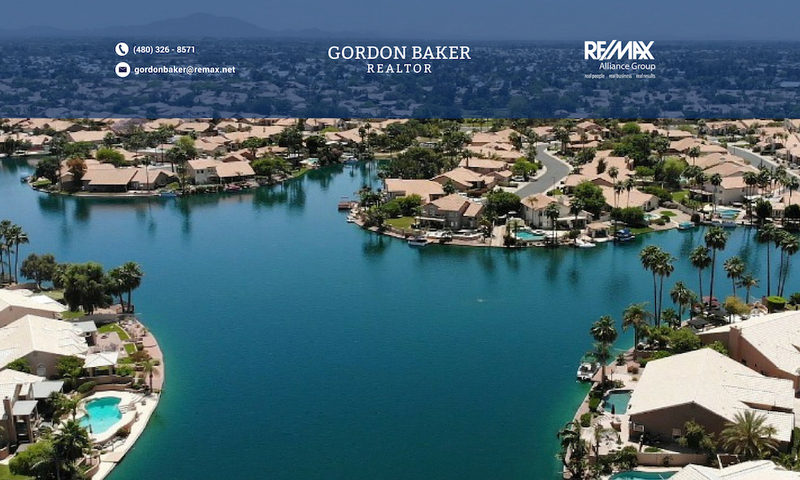 Bartlett Lake is 15 miles from north Scottsdale custom home communities such as Desert Mountain, Treviso, Mirabel, and Boulder Heights. Lake Pleasant is 35 miles west of Bartlett Lake and because Lake Pleasant is closer to Phoenix and the I-17 freeway, Bartlett Reservoir is closer to a smaller number of residents and therefore is less congested. Because of the surrounding topography, Bartlett Lake is calmer. The size is approximately 2,800 acres; larger than Canyon Lake or Saguaro Lake, but smaller than Lake Pleasant. For a more specialized search of homes near Bartlett Lake, call or e-mail me or fill out the attached form, Search the MLS for me. Beautiful Bing Hu contemporary home (Larkspur model) located on the 7th hole of the Apache Golf. Open floor plan, and fabulous golf course views! Open kitchen with large island, wine cooler, kitchen bar and Viking prof range. New tile floors and walk-in closets in the en-suite bedrooms. Custom cabinetry throughout. Fabulous wrap around patio with pool, spa, built in BBQ and nice views for year-round entertaining. Automatic sun shades on all windows. Entire outdoor drip system got recently replaced. Become part of the exclusive Desert Mountain Lifestyle. NEWLY REMODELED CUSTOM HOME SET BACK ON A SCENIC 2.76 ACRE LOT, LOCATED IN THE PRESTIGIOUS GATED COMMUNITY OF GRANITE MOUNTAIN RANCH. THIS EXQUISTE CONTEMPORARY HOME IS WELL APPOINTED WITH THE FINEST OF FINISHES. RESTORATION HARDWARE LIGHT FIXTURES, CEILING FANS, CABINET & DOOR HARDWARE. DESIGNER PLUMBING FIXTURES, GOURMET EAT IN KITCHEN,CHIC WHITE GRANITE COUNTER TOPS, WALK IN PANTRY, BUILT IN FRIDGE/FREEZER,TRASH COMPACTOR, VIKING GAS COOKTOP, CUSTOM STAINED BEAMS, CABINETS & 8' ALDER DOORS. KITCHEN OPENS TO GREATROOM, SURE TO IMPRESS ANYONE! FORMAL DINING RM W/ VIEWS OF 4 PEAKS,SPACIOUS MASTER STE,WALK IN CLOSET,SPA LIKE MASTER BATH,WALL OF STONE BEHIND SOAKING TUB,DBL SINKS,W/I SHOWER, NEW PLANK TILE/WOOD FLOORING IN ALL BEDROOMS, OVERSIZED 3 CAR GAR,EPOXY FLOOR FINISH & MORE!! Buy this home and receive either a $25,000 remodel credit OR price reduction at close! SUPER CLEAN, BRIGHT AND WELL-MAINTAINED SINGLE LEVEL HOME IN BEAUTIFUL TROON NEIGHBORHOOD- ONE OF BEST LOCATIONS FOR THE PRICE IN NORTH SCOTTSDALE. SOARING CEILINGS, OPEN CONCEPT KITCHEN AND LIVING SPACE. ACS UPDATED IN 2014/2013. EXTERIOR REPAINTED IN 2015. PARTIAL INTERIOR REPAINT 2019. MOVE RIGHT IN, OR REMODEL TO YOUR TASTE! CHECK OUT THE KITCHEN REMODEL PHOTO. MOTIVATED SELLER- bring all offers!! Great location and horse property on 1.25 acres with 3 stall barn plus tack room, turnouts/waterers and lit arena. Unobstructed views of Four Peaks and surrounding mountain ranges. Lounge in the backyard by newer play pool, built in BBQ and watch your horses play. Living room with cozy fireplace nicely flows into an open kitchen with breakfast bar and eat in nook. This home features rustic vega poles, knotty alder doors, wooden shutters & dual zone A/C with evap cooling system. Bring your horses, toys and enjoy the Rio Verde lifestyle in this cozy home. 10 minutes to Verde River, restaurants, gas station, golf courses, etc. Unlimited Hiking, biking or horseback riding from your property to McDowell Mountain Park, Scottsdale Preserve or Tonto National Forest. HUGE Price Reduction!!! Welcome to paradise! This 6 bed 6 bath 4860 Sq Ft foot custom built home is on 5 fully fenced acres in North Scottsdale. Got horses?? This home has Horse Corrals, a tack room and hay barn. Two resort style swimming Pools, a spa and gazebo with a swim up bar. This home is an entertainers Dream with its Majestic mountain, and Sonoran desert views! Its perfect for horse back riding and off-Roading. Bring your toys there's also a massive detached shop!!! Inside boasts a chef's kitchen, Wet bar and behind that beautiful wrought iron door is your very own wine room.You gotta see it to believe it!Come view this beautiful oasis today!! Magnificent opportunity to enjoy a North Scottsdale tranquil lifestyle. This contemporary home sits on just over 23 acres of pristine desert. Incredible exposure to the east and all the beauty of the mountains. Large garages that are air conditioned allow for cars, toys and RV's. Walls of windows bring the outside in and allow you to enjoy the surroundings. Great potential for future development, horse facility or artist retreat. Property is located minutes away from the new trail-head on 136th street. Hike, bike or ride on thousands of acres of preserve land. Property is being sold AS IS. Artwork and yard sculptures do not convey. The square footage of the home does not include almost 1,400 square feet of air conditioned garage space with epoxy floors and 4 garage door openings.